ideally Army should not but a man who has taken huge benefits from Establishment by always acting as their aide cannot reduce Establishment's interference in Politics. This can only be done by a man who has no allegations of financial corruption on him and who has not taken favors from Army, and clearly Nawaz Sharif does not fulfill that criteria. Nawaz Sharif is just trying to save his illgotten wealth and trying to avoid jail. Establishment has evolved over the period of time, they have given 10 years of uninterrupted democracy but what our politicians did in those 10 years, they simply plundered national wealth ( these last 10 years have been the worst in history of Pakistan). Establishment cannot sit and watch these bastards eating the whole country out, sometimes they have to take remedial measures, like they did in case of Altaf Hussain or for instance in case of war against terrorism. Nawaz the corrupt begged the aliens to topple the elected governments of Muhammad Khan Junejo and Benazir. The same aliens got him elected three times, then they were not aliens, now when the army has refused to support Nawaz Sharif in corruption cases, suddenly they have become aliens. Javaid Hashmi was minister in His ul Haq' s cabinet. Nawaz Sharif and Javaid Hashmi got funds from ISI to form IJÌ and topple Benazir's government. Javaid Hashmi aur Nawaz Sharif ko apnay gireban main daikh kar sharam say doob marna chahiye, yeh kis moonh say jamhoriat ki baat kartay hain. Nawaz Sharif has such an ugly history that he cannot be defended. Question is not about 100 days or 11 years, question is he took oath as a minister under a dictator. The same Javaid Hashmi received funds from ISI to form IJÌ along with Nawaz Sharif to stop PPP from coming into power. Ramadan main waqai such bolo balkay saara saal such bolo. No one question from those who used funds from our tax money for illegal matters. AlHaj Javaid Hasmi on assets of Nawaz Sharif. Those who were supposed to ask this question were receiving those funds, so who would question. Current Chief Justice has cancelled bails of Aslam Baig and General Asad Durrani and has taken the case up which was burried by Nawaz Sharif for years, now everything will become clear including the dark role of Nawaz Sharif and Javaid Hashmi. inida main pak army kay liay TAREEFI KALAMAAT ad kartay howay. Yeh sirf un kaliay hay jo edher udher say batain sun ka phany khan tu bantay hain likan dalail un kay pass naheen hotay aur dosroon kay dalain say ankhain band kar sirf ghandi zuban bolna jantay hain, because un ka ledear bhi tu aik zani hay. jis ka sala Z. smith ka aaj ka frman hay kay philstinun ka qatal-e-aam jaiz hay. ab kia kia jaiy aik zani aur us kay sala sab ko support kia jaiy jo islam ay khalaf hain? Almost all multinational companies belong to Yahoodi Employer / CEO including hi-tech / mobile / computers / plane / ships / food / beverage etc. which we used directly or indirectly on daily basis. Nawaz supporters are so desperate and illogical that when they find nothing against Imran Khan, they sound like Maulana Diesel ( Yahoodi lobby, what a joke). Look at the mental level of these Patwaris, chief justice who has taken various steps which effect common man ( like medical stents, clean drinking water, costly medicines, school fees reduction and many more) however these Patwaris are targeting the same chief justice because he has refused to bow down before Nawaz Sharif like Justice Qayum did in 90s ( tapes are on record). If the Patwaris are unable to see the reality, it will not change reality. Reality is that due to massive corruption, today Pakistan is in lot of trouble, 91 billion dollars worth foreign loans, falling exports and reserves, rising imports, tumbling reserves, everything is very clear. 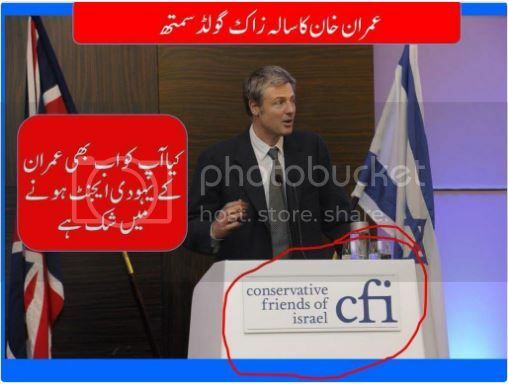 Actual Jewish agents are the one who have sold Pakistan to IMF, actual Jewish agents are those who sent Shahid Khaqan to America on private tour to seek American help. Actual jewish agents are the one who came back to Pakistan only after an NRO that was arranged by America as these bastards look after their interest ( Condo Liza Rice book is on record). Actual Jewish agents are the one who testified Indian version on Mumbai attacks. Daleel, Suni sunai NAHI. So called Yahoodi agent Bashing America on BBC. Nawaz Sharif ka baap bhi yeh kehna tou dore, soch bhi NAHI sakta.